Matt Smith, who the BBC announced four and a half years ago would be the one to play The Doctor after David Tennant left the role, is leaving Doctor Who at the end of this current season. It will be during this year's Christmas special that the Eleventh Doctor will regenerate, and Smith will hand off to a new actor. It was really bittersweet to hear that news tonight. I do think that Matt Smith is taking his bow at the top of his game. In no small part because of his portrayal of The Doctor, the show has never before been so wildly popular. The past several years have seen Doctor Who truly become a global sensation, and in this blogger's opinion Smith has become one of the very, very few deserving to be recognized as a pop icon. He will be the reigning Doctor for the massive fiftieth anniversary special coming on November 23rd. After everything he has accomplished as the Eleventh Doctor, it would be really hard to find a way to top all of that and go out bigger than that. But all the same, I think I'm going to miss Matt Smith's Doctor more than any other. In too many ways than could readily be gone into, the era of the Eleventh really did wind up my favorite of the revived series. Even so, he will not be soon forgotten. Because of Matt Smith, "bow ties were never cooler", as showrunner Steven Moffat said earlier today. Indeed, no other Doctor has made such an impact on modern fashion. So here it is at last. 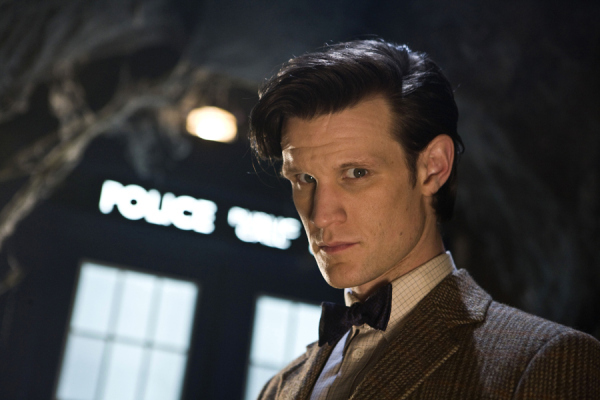 Matt Smith is about to leave one of the most legendary roles in the history of television. And as Moffat put it, "Somewhere out there right now - all unknowing, just going about their business - is someone who's about to become the Doctor. A life is going to change." To say nothing of the regeneration scene itself, considered by many to be the finest in the history of the show. It was certainly the most emotional. Two words for the next Doctor. Considering that Hollywood cast Brits as Spiderman, Batman, and the most American of superheroes - Superman, I recommend they cast an American as Dr. Who. And James Bond is next.